September 1, 2015 the Hair stuff., the Makeup stuff., the Skin stuff. I recently realized that I’ve lost my NARS Velvet Matte Lip Pencil in Cruella. I have no idea where it is. It doesn’t help that I’ve moved across the country within the past month by car. That lip crayon could be anywhere. For all I know some lucky corn farmer in Nebraska discovered the greatest shade of red lying in his field just off the highway a couple weeks ago, and is now wearing it proudly as he drives his John Deere. Bless him. The real bummer is that normally, I would take a jaunt down to my nearest Sephora this weekend and pick up a brand new lip crayon to replace my lost one. However, I am currently searching for jobs and waiting for many application responses. And while our bank account isn’t in dangerous territory by most standards, something about purchasing a … *gulps with guilt* … thirty dollar lipstick these days feels slightly out of responsible boundaries right now. And now that I think about it, maybe the real, REAL bummer is the fact that I thought I needed a NARS Velvet Matte Lip Pencil in Cruella when I also have a NARS Velvet Matte Lip Pencil in Dragon Girl, MAC’s matte lipstick in Ruby Woo, and MAC’s lipstick in Russian Red. Just silly. Maybe one shade of red can be good enough for now. After all, where did fifty shades of grey get us? It got us nowhere. In relationships, in literature, in filmmaking, as women- nowhere. And I don’t want to be ignorant of history and repeat humankind’s same mortal mistakes. Anyways, now that you’re done being angry with me, we can move on to the main subject- drugstore finds! And I’m talking drugstore finds that I have purchased and then used multiple times, much more than once. With a renewed mindfulness toward money, I’m seeing that finding value in a great drugstore find is something to be relished. Finding something that really works well for under ten dollars is just the best. Sure, you’re lacking the “name”, or the pretty compact, or the lovely fragrance emitting from your mascara (I’m looking at you, DiorShow), but seriously- who cares? 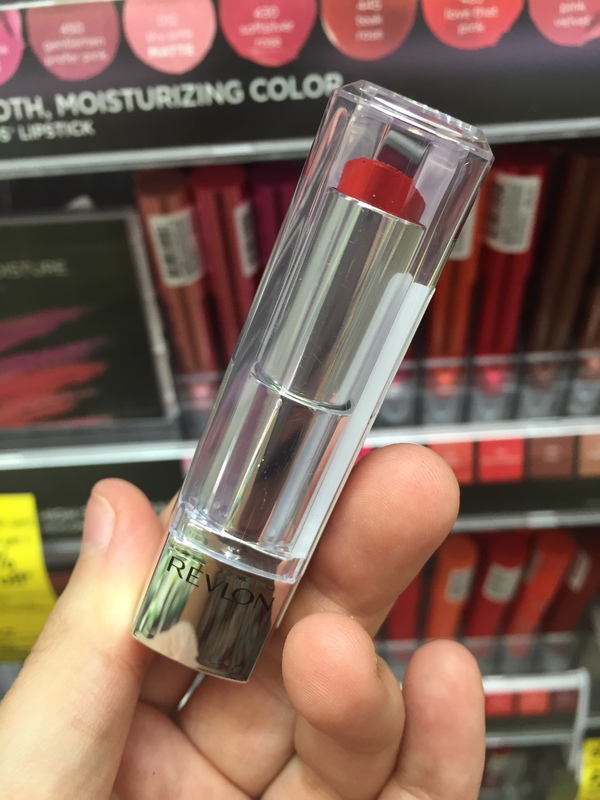 Speaking of shades of red, Revlon’s Ultra HD Lipstick in Gladiolus is an amazing drugstore choice. I purchased it when I got the run-down of Emma Stone’s makeup at this year’s SAG awards, which I was obsessed with. Her makeup artist, Rachel Goodwin, has done a brilliant job at incorporating new Revlon products into Emma’s looks. What I really like about this formula is that it’s very comfortable. This is not a matte shade at all, which is what I typically go for, but after wearing so many matte shades you tend to forget that lipstick actually can be creamy and comfortable (and as much as I love Ruby Woo, it makes my lips dry as a desert). Such is the case with the Ultra HD; it’s very easy to wear. I find that this shade is not brick or orange-y, and not too blue-based either. It’s really beautiful on Emma with fair skin, but I also found it to be flattering on my skin tone which is more of an olive at times. If you’re looking for a cheap red to try, I recommend this to you. I sometimes feel bad advocating for drugstore hair products because I know that salons rely heavily on their retail sales and I’m very much about supporting local salons. However, hairspray is one product that I have never purchased from a salon because I don’t use it very often, and I honestly haven’t seen much of a difference in quality between salon hairspray or drugstore brands. Moreover, some drugstore hairspray fragrances are so nostalgic to me. Aussie, anyone? And I will always associate Tresseme’s hairspray scent with my mom, who uses it every morning. There was one occasion though when I needed a heavy duty hairspray that would hold an updo and help with teasing (which I hate to do). I was going to a Halloween party as Holly Golightly, and I needed to recreate her French twist with all the volume at the crown. 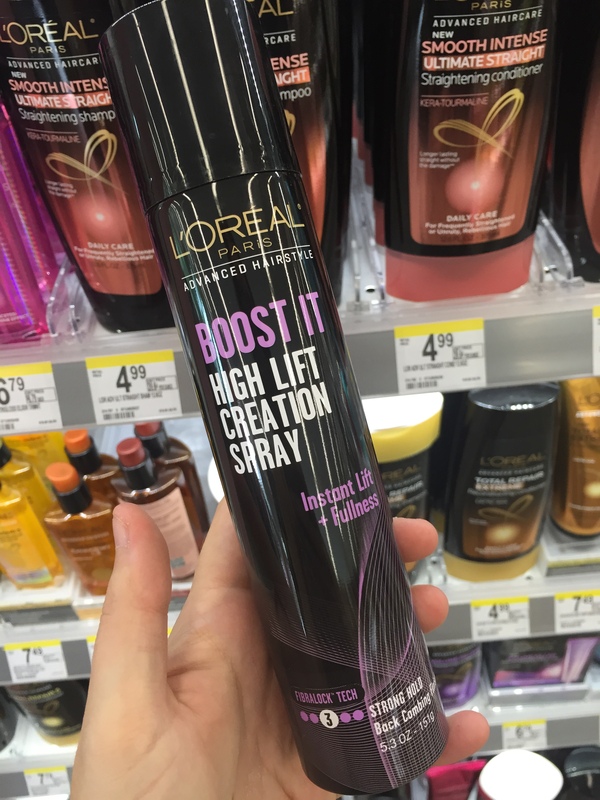 L’Oreal’s Boost It High Lift Creation Spray is like the monster glue of hairspray, in my opinion. You know when a hairspray isn’t so much a mist as it is a web? That’s this stuff. It has a backcombing, mattifying effect that was perfect for my updo on Halloween. You can spray it and then tease a section of hair into Dolly Parton oblivion, or just mist it all over your hair and then watch it not move for the next 24 hours. And the scent is very addicting but very strong, so, it’s basically smack as hairspray. Proceed with caution. 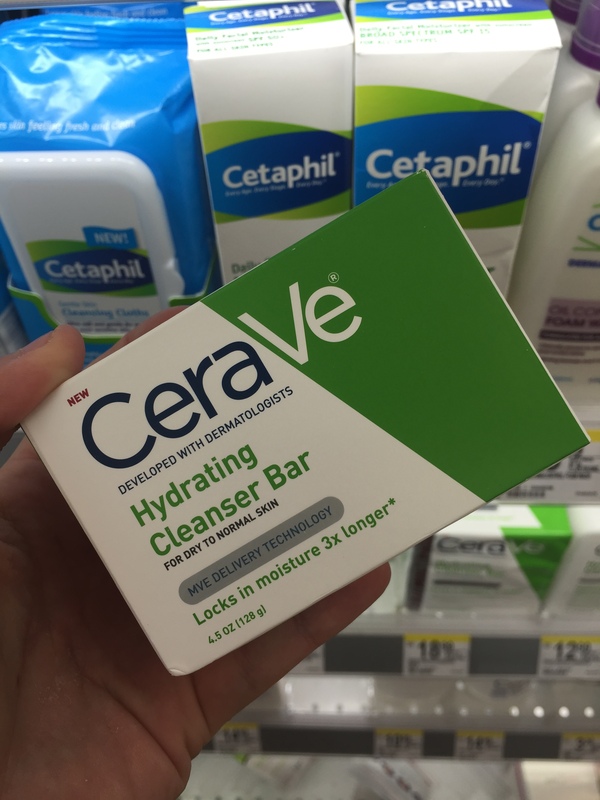 I used CeraVe’s Hydrating Cleanser Bar for the first time one month ago when I was staying at my mom-in-law’s house after we’d moved out of our apartment. The scent is very clinical and soapy to me, but the soft texture it left behind on my skin was unmistakable. I couldn’t wait for showers when using this bar, and I’ve continued to purchase it out here in Illinois. I’ve always used body washes dispensed from bottles, and I have a tendency to probably use too much as a time and a lot more than is needed. You have that advantage with a soap bar in that you’re not squeezing too much out, but the disadvantage is that the bar gets wet over time and can dissolve when you’re not using it, causing you to lose soap that way. Regardless, I’ve been keeping CeraVe in rotation in our shower and will probably continue to do so when things get really windy in the winter. As I continue to grow out my hair in my endless quest for whatever it is I think I’m looking for, I’m starting to refocus my efforts on maintaining healthy and full ends. This task used to be my number one priority when it came hair, but my recent chop has granted me some freedom in not having to think of split or broken ends so much. Though my hair hasn’t reached my collar bone yet, I’m trying to become conscious again about heat protectants, being careful with aggressive hair ties, and using products that help to at least give the illusion of fuller ends. 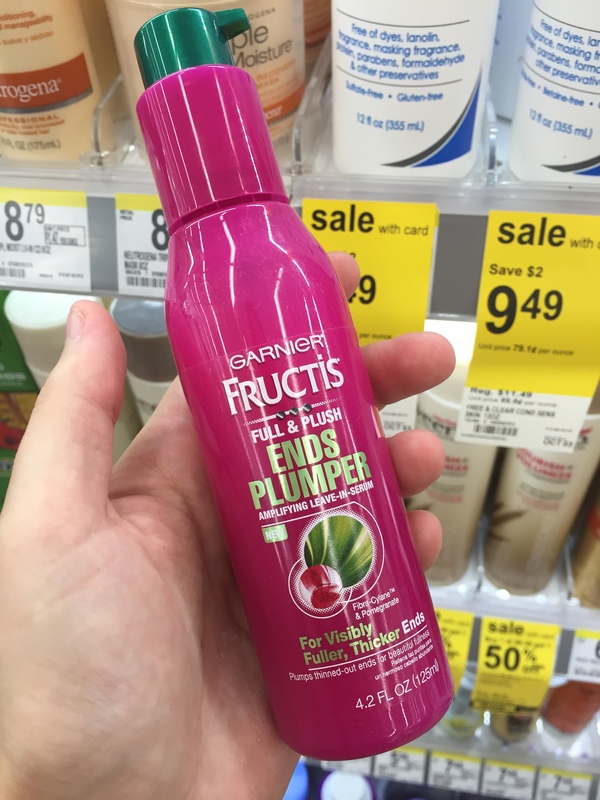 I don’t think Garnier Fructis’ Full and Plush Ends Plumper Amplifying Leave-In Serum does a ton in the way of split end prevention, but it does at least temporarily seal ends to give them a healthier look. This is also a good thing for volume as my hair starts to grow out and loses its natural volume that came from such a short cut. I sampled Bumble and bumble’s new Full Potential line the other day and rubbed some of the Garner into my ends before hitting my hair with a blow-dryer for about three minutes, and wowie- my hair got huge, and not just from the scalp but all over.